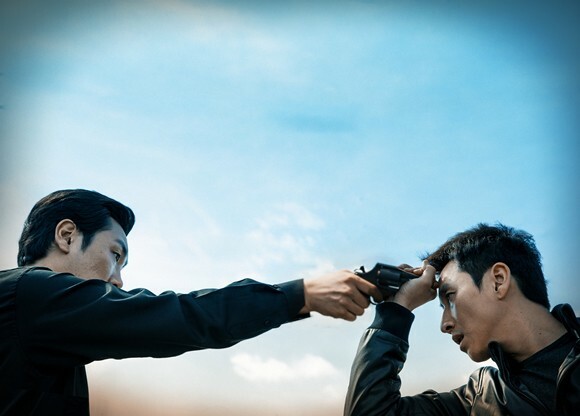 When internal affairs unexpectedly show up at the precinct and begin to investigate, corrupt detective Go Geun-soo (Lee Seon-gyoon (이선균) is forced to make excuses at his late mother’s funeral and race back to prevent his guilt from being unearthed. Driving fast and stressed from his predicament, Go accidently hits and kills a passerby. Secretly disposing of the body and cunningly destroying evidence of his involvement, Go believes he’s in the clear…until he receives an anonymous phone call from a witness (Jo Jin-woong (조진웅) threatening to reveal his sordid crime. Unless Go complies with the demands his world will be over, beginning a frantic game of suspense as they battle to emerge victorious and unscathed. From the moment it begins, A Hard Day is an exciting, captivating, and down right thrilling cinematic joyride. Writer/director Kim Seong-hoon (김성훈) has crafted an enthralling and suspense fuelled tale that constantly keeps the audience guessing, through the incorporation of a variety of inspired set-pieces that takes staples of the genre yet reinvents them enough to keep them fresh and appealing. Whether it be the initial hit-and-run incident, the disposal of the body, car chases or physical combat, director Kim builds tension brilliantly to consistently excite and entertain. Alongside editor Kim Chang-ju, who sutures the scenes to incredible effect, the duo have combined to create some of the most gratifying and well made action-thriller sequences in recent memory. Yet despite all the conflict and terrifying situations that arise, the film is never morbid due to the dark ironic humour laced throughout that adds genuine laugh-out-loud moments to the proceedings, a real rarity that serves to both inspire and rejuvenate a genre that has, of late, become quite stagnant. As such the 2 hour and 30 minute running time simply flies by, making A Hard Day one of the most entertaining filmic experiences of the year, and well deserving of its premiere at the Cannes Film Festival. Central to the enjoyment of A Hard Day are the wonderfully charismatic performances of Lee Seon-gyoon and Jo Jin-woong. Lee is great as corrupt detective Go, effectively conveying the anti-hero as selfish and unethical but also quite likable and ultimately sympathetic given the fraught circumstances that arise. Lee has an ‘everyman’ quality that he employs effortlessly throughout the film that generates an acute connection with the audience, so much so that it’s entirely possible to forgive Go for his dishonesty and actually root for him as the underdog victim. Jo, meanwhile, appears to absolutely relish the opportunity portraying the villainous blackmailer, to the point where despite his supporting actor status, he threatens to steal the film every time he appears on screen. He is a hulking pillar of evil, yet his comic timing and delivery are so comically entertaining that he’s impossible to dislike, adding a wonderfully fresh dimension to the relationship between the antagonists that is consistently fascinating to watch unfold. A Hard Day is one of the most exciting and entertaining action-thrillers of the year. Director Kim Seong-hoon has crafted a thoroughly engaging, suspenseful and darkly humourous tale of corruption that consistently feels fresh through the reinvention of genre traits. Featuring highly charismatic performances from leads Lee Seon-gyoon and Jo Jin-woong, A Hard Day is a thrilling cinematic joyride from start to finish.